「人物專訪」-Luke Cameron "The Way" English — Betel nut co.
Life is a journey and can take you on a crazy adventure. You never know where you’ll end up in the end and that is what happened with Luke. Originally from Canada and now residing and calling Taiwan home, he went from filming friends to now making his own documentaries. Please enjoy this interview and support his new film ‘The Way’ at the Urban Nomad festival May 26, 2018. 1. Tell us who you are and where are you currently right now? My name is Luke Cameron, I’m a filmmaker from Canada who works and resides in Taiwan. I’m out of the country at the moment working on some TV commercials in the States. 2. Where are you originally from and tell us about your life growing up. I grew up in the Rocky Mountains in Canada and started shooting skateboard and snowboard movies with my friends. From there that progressed to making short films in the horror and comedy genres and later moved into documentary filmmaking. 3. How did you first get introduced to surfing? I went to a place called Tofino in Canada when I was 16 and tried surfing for my first time then. It was so different to snowboarding as you didn’t need as much equipment, a lift ticket or a ride to the mountains. It felt so accessible and free. I pretty much fell in love with the sport then and never looked back. 4. What brought you over to Taiwan? Surfing actually! I went there to surf when I was 20 and ended up staying and teaching English to make money to continue surfing there. It was after a few years that I realized I wanted to make Taiwan home and then moved into the film and TV scene to support myself and stay connected with the surf scene. 5. Tell us about the surf scene here in Taiwan when you first started. It was empty everywhere. Only you and the people you went surfing with that day would be in the water. 6. What made you want to get into film? You eventually left Taiwan to study film is that correct? Where did you study film at? I’ve always been interested in telling stories through film. I guess I just like documenting what happens around me and I’ve always liked writing as well. I left Taiwan for a few years to do my BA in film in Australia. Australia seemed like a good fit as I could surf before going to university each morning! 7. Now tell us a little more about your upcoming film, 'The Way' and what was the motivation to create this film. ‘The Way’ fell into my lap 5 years ago after a friend came across the old surfboard that we trace back to its owner. He wanted to do a road trip with the board and document it. After a few months of research we decided to open the film up to include the current generation of Kiwi surfers who want to make surfing their lives and really showcase what it takes to make surfing your life and live out your dreams. I was finally able to make a surfing film which blended both my love of filmmaking and the sport of surfing. 8. It’s not easy creating a documentary film, you’ve traveled all around New Zealand meeting different characters who are all interrelated. What were some of the trouble times that you went through during the process of filming this? I’d say logistics of getting all the surfers in the country at the same time. They all have such hectic schedules and getting them all in the country for a month wasn’t easy but we made it work! 9. What were some of the parts in the production of this film that made you proud that you were making it? I think just finishing the film to be honest. It took just over 3 years, a lot of sweat, blood and energy to complete it and a lot of my own money. I’m just happy that everyone who contributed to it in any way shape or form did and were able to help me complete this movie. 10. Tell the people reading this interview why they should come see this film. This film is about following your dreams and achieving your goals in life. Even if you don’t surf this film is uplifting and should make you want to do more with your personal goals when you leave the theater. If you are a surfer from Taiwan; New Zealand and Taiwan have a lot in common, both are small countries with not many surfers, so if someone from New Zealand can make it to the World Tour, then so can you! 11. 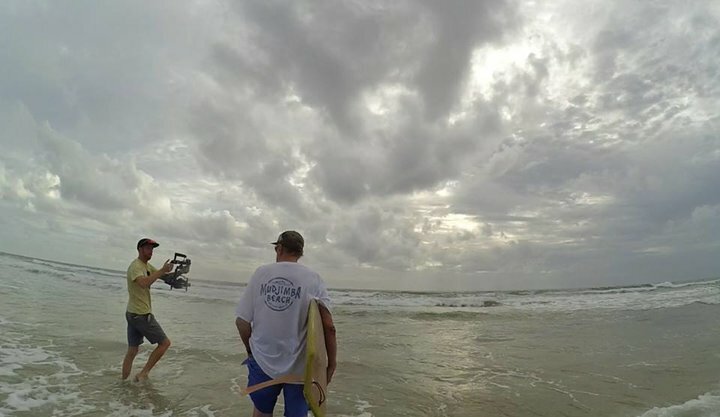 For someone who wants to pursue filming, especially in surf, what are some advice you have for them? Shoot everything. When you go for a surf with your friends, wait 30 minutes after they paddle out and film them. Also try to shoot from different angles, don’t just set up on the most convenient place on the beach, get some interesting angles, and don’t be afraid to swim out ( get a water housing for your camera ) and shoot from the water! It’s also a good idea to get a good camera, either a DSLR or a mirrorless one and a decent 300mm lens. 12. When was the last time you surfed and what board did you surf? I haven’t surfed in over a month as I’ve been too busy with work. I recently got a Slater Designs Sci-Fi and have been loving that though! 13. What can we expect to see more of from you in the future?